Measuring for women's garments using a dress form for the perfect fit. 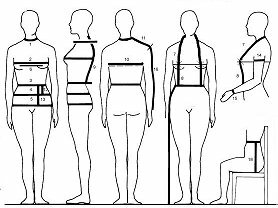 When using a dressform or dressmakers dummy or dressmaking mannequin the following measurements are needed for a perfect fit. Print out this page, then use the table below and fill in your measurements, then adjust your new dress from to the correct sizes, you may even need to pad out the dress form a little for the awkwardly shaped areas... use foam or wadding to adjust where necessary. Keep the size chart handy when making your next garment, it may come in handy. Don't take measurements yourself, best to have someone else take them. Stand straight but relaxed when you are being measured. You will get the best results if the subject is wearing only her underwear. Tie 3 cm (1 inch) wide elastic bands around your waist and hips. Locate the correct placements for these elastic bands carefully. Keep these elastic bands in place during the whole measuring process. Hip elastic is fastened on the level where hip circumference is maximum. Depending on your build, this may be over your buttocks (18-20 cm from waist downwards) or on top of your thighs (25-30 cm from waist downwards), or in between. BE ESPECIALLY CAREFUL WHEN TAKING THE MEASUREMENTS PRINTED IN RED ABOVE . They are crucial for good fitting patterns. After having taken all the measurements, take these measurements once again. Except for pants' cuff circumference and skirt/dress length, all measurements are body measurements. DO NOT ADD ANY EASE to the measurements. Print this page... measure your body and fill in the grid below. YOU CAN USE CENTIMETRES OR INCHES to the nearest 1/4 inch or, to the nearest centimetre. Abdomen (= top hip) circumference. If the subject's abdomen circumference is more than her hip circumference, use abdomen circumference also as the measurement for the hip circumference. Waist heightfrom center of back neck over shoulder to apex of one breast and from there vertically to lower edge of waist elastic. To get a more accurate measurement, loop the tape up one side, over the neck and down the other side (=double) and divide the result by 2 (see picture). Take this and bust height measurements together in one step. Back length from center of back neck to lower edge of waist elastic. To get this measurement taken correctly, please do as follows: use two measuring tapes. Put one of them hanging around your neck so that the loose ends of the tape hang on your bust. Put an elastic around your waist. Measure back length from the lower edge of the measuring tape around your neck to the lower edge of the elastic around your waist. Back width hang your arms relaxed at your sides. The measurement is taken from and to the point where your arm meets your body (but not to armpit) about 10 cm below base of neck. Shoulder length from neck to shoulder tip. To find the shoulder tip, raise your arm to horizontal position and feel where there is a hollow spot between shoulder and arm bones. Abdomen height: vertical measurements from lower edge of waist elastic to level where abdomen circumference is maximum. Crotch depth sit on bench or chair, measure vertically from waist elastic to chair level at side. Crotch depth can also be measured from a pair of old, well fitting pants, crotch depth is the difference between outside and inside length of pants.